Mental Health issues are on the rise and currently at an all-time high at 1.7 million (reported from the Medibank Better Health Index). 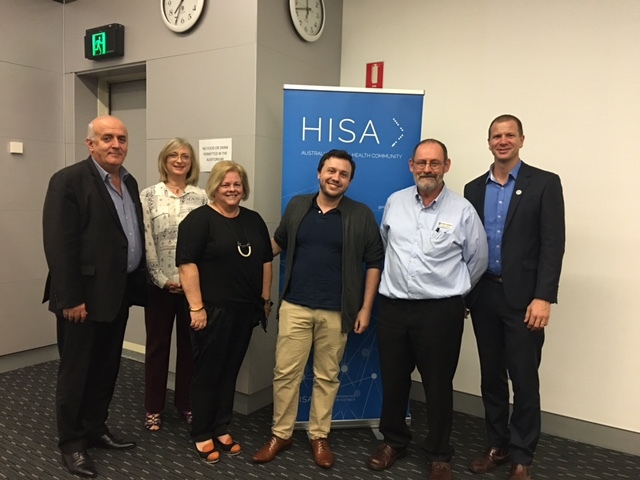 At HISA Queensland’s May 2017 seminar, the theme was mental health and how technology and health informatics can enable health service providers to be more proactive – without an additional injection of funds or services. a platform for delivery of healthcare that challenges the status quo e.g. gamification integrated in psycho-pathological assessments. The clever use of health data can increase our ability to predict and to derive true meaning. We cannot look at data at face value. If we can change the way we approach our data about mental health issues and services, then we may find the solutions that have been staring at us all along. Data science and technology – I am calling it – the next wave of scientific breakthroughs in mental health. Mental health and the enabling role of technology was the topic for last week’s Qld branch event. Thank you to Ivan Frkovic (left), deputy CEO of Aftercare, pictured here with committee members Susan Smith and Ann Maree Liddy; psychologist Wesley (Wes) Turner from Griffith University; Prof David Crompton OAM, Executive Director, Addiction and Mental Health Services, Metro South and committee member Grant Hawgood.